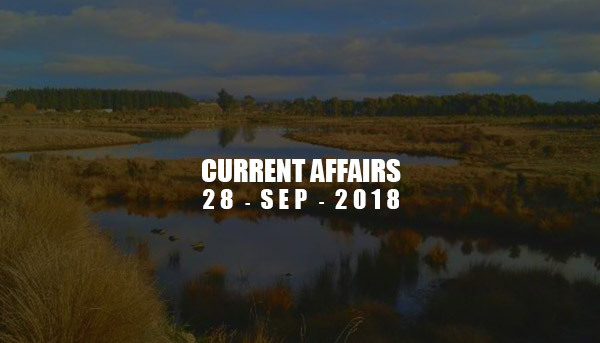 Current Affairs - Sep 28, 2018 - IAS - Daily Current Affairs, IAS Syllabus Exam Strategy, IAS Preparation. World Rabies Day is celebrated on 28th September to increase awareness about rabies prevention. The subject of 2018 'Rabies: Share the message. Save life '. This day marks the death anniversary of Louis Pasteur, French chemist, and microbiologist, who developed the first rabies vaccine. The Ramsar Convention has recently issued its first-ever global report on the state of World's wetlands. The report found that around 35% of wetlands were lost between 1970 and 2015. Wetlands include lakes, rivers, marshes and peatlands, as well as coastal and marine areas like lagoons, mangroves and coral reefs. In India, The Ministry of Environment, Forest and Climate Change is the nodal Ministry for wetlands conservation. Wetlands in India account for 4.7% of the total geographical area. India's 96th place in 162 countries on the Global Economic Freedom Index released by the Center for Civil Society (CCS). In the previous year's report, India was at the 98th place in the index. Hong Kong and Singapore topped the index with the first and second positions respectively. The 2018 report is based on 2016 data. Election Commission has recently asserted that MCC will come into effect from the day the premature dissolution of an Assembly in a State or a Union Territory is announced. It will remain in force until the new government is formed. The Government of India has increased its contribution in the State Disaster Response Fund (SDRF) from 75% to 90% from April 2018. According to the revised guidelines, the Government of India will contribute 90% while the State Relief Fund will contribute 10%. SDRF was established at the state level to meet the rescue and relief expenditure of disaster-affected states. Argentina has received the biggest loan package ever from the International Monetary Fund (IMF). In the next three years, a loan quantity of $ 57 billion is going to be distributed. Its goal is to revive the economy of Argentina. According to the loan agreement, as long as the value of peso remains above the level of 44 Peso per USD the Central Bank of Argentina will not be allowed to intervene in stabilizing its currency. RBI has recently notified that banks are allowed to use up to 15 % (currently 13%) of holdings under the SLR reserves to meet their liquidity coverage ratio (LCR) requirements. NASA's Mars orbiter has recently spotted Opportunity Rover on the red planet for the first time since it went into hibernation after a dust storm. The government has set up an 8-member Lokpal Search Committee under the chairmanship of Justice Ranjana Prakash Desai, a judge of the Supreme Court, Justice. India and United Nations signed India-United Nations Sustainable Development Framework (UNSDF) for 2018-2022.